The Mennonite Church of Vernon (MCOV) was founded in 1980 with 13 charter members, originating through outreach by the Conference of Mennonites in British Columbia. The congregation purchased and renovated a building on 27th Street in which to meet, and relocated to their present location in 1993. Edwin and Anne Brandt are considered the founding leaders of the group, serving from 1980 until 1990, during which time MCOV joined the Conference of Mennonites in British Columbia in February 1981 and the Conference of Mennonites in Canada in July 1981. Ed and Tiena Giesbrecht served from 1986 to 1999. During their ministry the church became known as the "Little Brown Church with the Big Heart." By 1990 it was evident that a bigger facility was necessary. The average attendance increased to an average of 130 for 1994. Geoff Thiessen served 2000-2002; attendance and membership grew to the highest point during this time. Hosting the Mennonite Church British Columbia annual conference in June 2002 was a milestone for the congregation. Eugene Harder served 2003-2005, and Bob Cowan became lead pastor in May 2005 and in September of that year the church celebrated 25 years of God’s faithfulness. By the end of 2006 the congregation was also able to retire the mortgage. The church has held Sunday school and Daily Vacation Bible School and has been active in home and foreign missions as well as locally at the Gleaners and the local food bank. Young people’s mission trips and Mennonite Central Committee volunteers have gone out and Julia Koop is a missionary to Papua New Guinea. Music has always been an integral put of the worship service and singing and instrumental groups as well as a choir were always prepared to be a part of the Sunday worship service and other programs. For many years singing at an Extended Care Facility has taken place the first Sunday of month. When MCOV first organized, hymn books were always used but in later years the introduction of new songs were done by worship leaders using overheads. The congregation was a member of the Conference of Mennonites in Canada until 2000 and Mennonite Church British Columbia until 2006. The congregation left both conferences following a decade of discussions on the issue of homosexuality. It was felt that neither conference had adequately addressed the congregation’s concerns on this issue. In 2008 the congregation merged with the Cornerstone Evangelical Free Church in Vernon to form Grace Bible Church of Vernon, a non-denominational church. Canadian Mennonite (20 February 2006). "Church Gets a Welcome Invasion." Vernon Morning Star. 13 July 2010. Web. 16 July 2010. http://www.bclocalnews.com/okanagan_similkameen/vernonmorningstar/lifestyles/98371804.html. Mennonite Reporter (27 October 1980), 5; (22 December 1980), 4; (20 March 1989), B1; (7 January 1991), 4. Thiessen, Ed and Anita Thiessen. 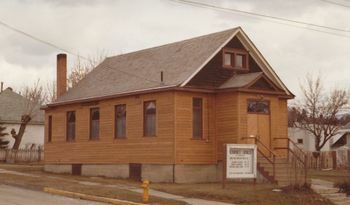 "Mennonite Church of Vernon (Vernon, British Columbia, Canada)." Global Anabaptist Mennonite Encyclopedia Online. March 2012. Web. 25 Apr 2019. http://gameo.org/index.php?title=Mennonite_Church_of_Vernon_(Vernon,_British_Columbia,_Canada)&oldid=142495. Thiessen, Ed and Anita Thiessen. (March 2012). Mennonite Church of Vernon (Vernon, British Columbia, Canada). Global Anabaptist Mennonite Encyclopedia Online. Retrieved 25 April 2019, from http://gameo.org/index.php?title=Mennonite_Church_of_Vernon_(Vernon,_British_Columbia,_Canada)&oldid=142495.